How do you eat your cabbage? Do you actually eat any? If not, you should give it a try. Really. I mean it. First, cabbage is really good for you; it's also very affordable and if you are lucky to find fresh whole cabbages near where you live, you could have enough to serve it over several meals. I personally don't like cabbage in a soup (bad memories of camp food). I love it when it's cured and made in Choucroute (with meat or with fish). I also love in Coleslaw, which, as you may recall, is now one of my favorite recipe for raw cabbage. I also cook it in stews like the Potée Lorraine but I won't cook that dish often. 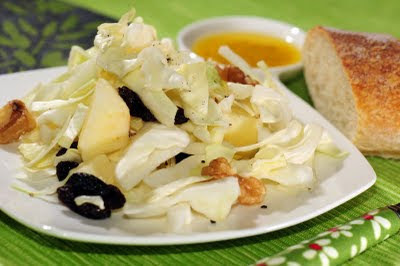 The following recipe is a traditional way I grew up eating raw cabbage in France. My mother would cook it for us generally as an appetizer salad before a vegetarian entree. Contrary to other recipes I have seen in the US, the dressing is not made with mayonnaise (please, try to think beyond the mayo!). I only made a vinaigrette with Balsamic vinegar. My children did not enjoy this salad that much because of the cabbage. It's partly my fault because I did not shred it thin enough for them (they eat Coleslaw afterall). My older one was telling me "it's not my favorite dish"... and the little one spat the cabbage and dug for the walnuts ("noix, encore noix", "walnuts, more walnuts")...So : they ate the apples, the cheese, the raisins, and the walnuts..... in a way, they had enough to eat for that meal! My husband, on the other hand, could not get enough of this salad! Bon Appétit! Don't add the dressing to the whole salad if you think you made too much; you can serve it the following day if no dressing was added.